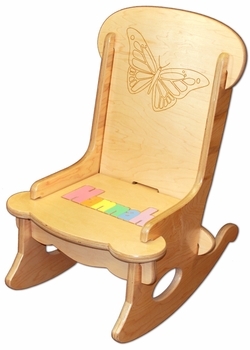 A charming butterfly or princess image is engraved on the seat back along with the baby’s name letters as a colorful puzzle right in the seat! Designed for little girls, this sturdy rocking chair is built from quality maple hardwood and measures 28” by 17” wide. Assembly is required however no tools or added hardware are needed. Like any other puzzle, the letters are removable from the seat and a personal message can also be engraved on the back for you to make this gift even more personal.